Hoo Fest 2019 – Comic Con on the Farm. 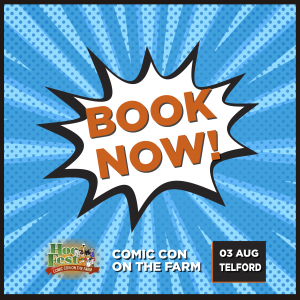 Home > Hoo Fest 2019 – Comic Con on the Farm. Hoo Fest is a brand new event for Hoo Farm Animal Kingdom! In conjunction with Really Wild Events, come down to meet some stars of stage and screen, experience some amazing activities along with enjoying all the usual fun events we have to offer. Visit the Hoo Fest website to find out more details about the event, along with announcements of appearances and special guests over the next few weeks!